10.7cm solar radio flux monitoring telescope – over the last 50 years, this telescope has reliably measured the Sun’s activity! 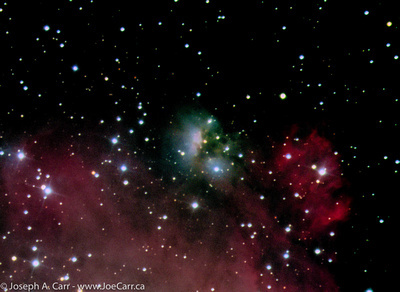 John A. Galt Telescope – 26m prime-focus, equatorially-mounted telescope. First radio astronomical observations using Very Long Baseline Interferometry (with Algonquin) Apr 17, 1967. 22MHz telescope – Instrument consists of 1,700 telephone poles supporting miles of wire. It mapped the entire sky in very long radio wavelengths (13.6cm) from 1960s-70s. There is a panoramic image of the Radio Milky Way on display in the main building foyer, which is derived from data from the Galactic Plane Survey done by this radio telescope over 10 years. 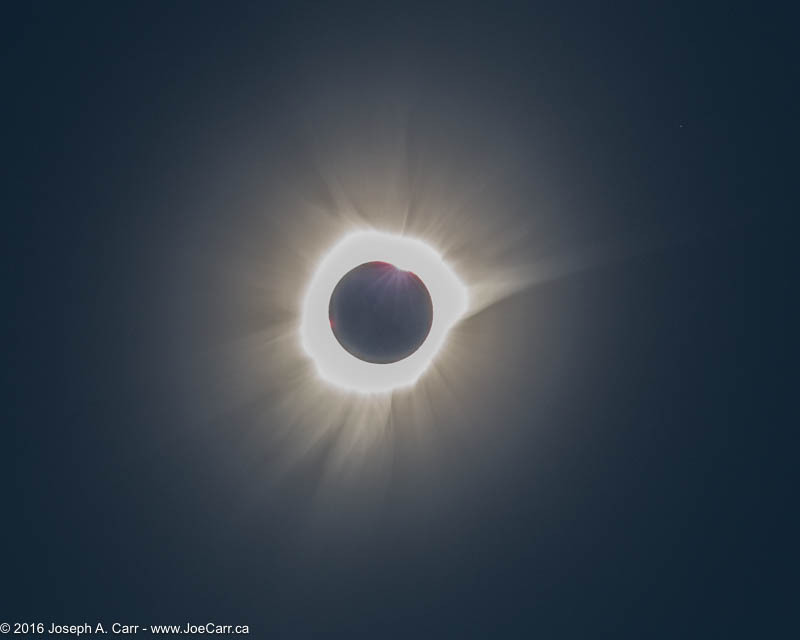 The Royal Astronomical Society of Canada’s General Assembly held at the University of Calgary is probably not too interesting for people who are not members of RASC. That said, I’m going to combine the three day conference into one report on this page, just to complete my road trip travelogue. I arrive in Calgary in the late afternoon. The RASC General Assembly (GA) registration desk is setup in the hotel lobby, so after I get settled in my room, I go downstairs to pick up my delegate’s package. 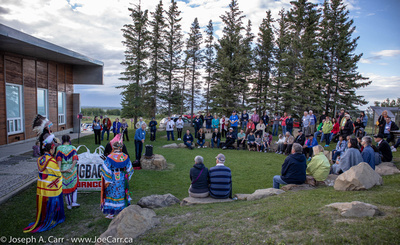 I connect with a few people I know in the lobby while we wait for buses to take us to the Members’ Welcome BBQ dinner and First Nations performances at the Rothney Observatory, in the country south of Calgary. We also get to tour the observatories operating from this site. 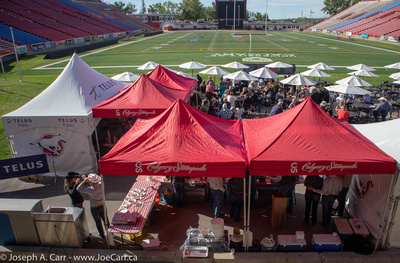 The Calgary Stampede put on a Stampede Breakfast for delegates this morning before the GA started, serving pancakes, eggs, bacon and sausage in the end-field zone of the home stadium of the Calgary Stampeders Canadian football club. Dr. Robert Thirsk, astronaut and Chancellor of the University of Calgary welcomed delegates to Calgary and the University. today is his last day as Chancellor, and our event is his last function before leaving. He tells us that being in space showed him the interconnection of the natural world with humans. He illustrates the point with many spectacular photos taken from the International Space Station, and also speculates on the question –Will we be here into the future? (100 years probably, 1,000 years probably not), and also reviews the next steps humans will make in space. He offers the opinion that a Moon base will be part of this new wave of exploration. In the afternoon, I take the Nocturnal Preserve Tour to the Ann & Sandy Cross Conservation Area south of Calgary. This is a RASC-recognized nocturnal preserve, which supports the notion that pristine night skies are not only good for humans, but all creatures on this Earth. We all depend on darkness to restore our health while we sleep, which helps all lifeforms prosper, not just those that are active at night. We walked part of their extensive property to appreciate the varied ecosystems found in what is now mainly the farmland of southern Alberta. 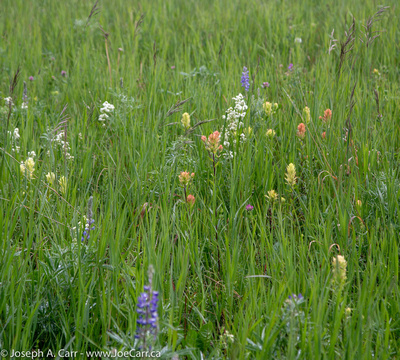 Grass suitable for grazing cattle displaces the native grasses, which disrupts the ecology in the area, but remediation is possible. After dinner, the Plaskett Medal Award Lecture is “Dicke’s Superrradiance in Astrophysics” by Dr. Fereshteh Rajabi, Postdoctoral Fellow in the Institute for Quantum Computing at the University of Waterloo. Dr. Rajabi gets into quantum mechanics and masers, and how they cause celestial objects to emit previously-unexplained bursts of intense radiation. I’m always happy to see such smart people working to understand our universe better, despite me not always fully appreciating what they are describing! After a buffet dinner with my fellow astronomers as part of the conference, I attend the public lecture: “The Golden Age of Solar System Exploration” given by Emily Lakdawalla, The Planetary Society. Emily reviews many of the more exciting recent missions to explore our solar system: Hayabusa2, New Horizons, and Cassini, to name a few. She also highlights how amateur astronomers are using data from these missions, and how they are contributing to the resulting scientific discoveries. Emily takes lots of questions from the audience. There were more presentations this morning, concentrated on the history of RASC and astronomy: RASC in Travelling Mode (historic solar eclipse expeditions); Styles of Observing in the RASC Since 1868 (taken from the RASC archives, including telescope-making); RASC and the Space age (amateurs as both participants and spectators); The Cultural/Social Anthropology within RASC (who makes up the ranks of RASC members? ); Female Participation in the RASC (RASC leads as an inclusive society in Canada). 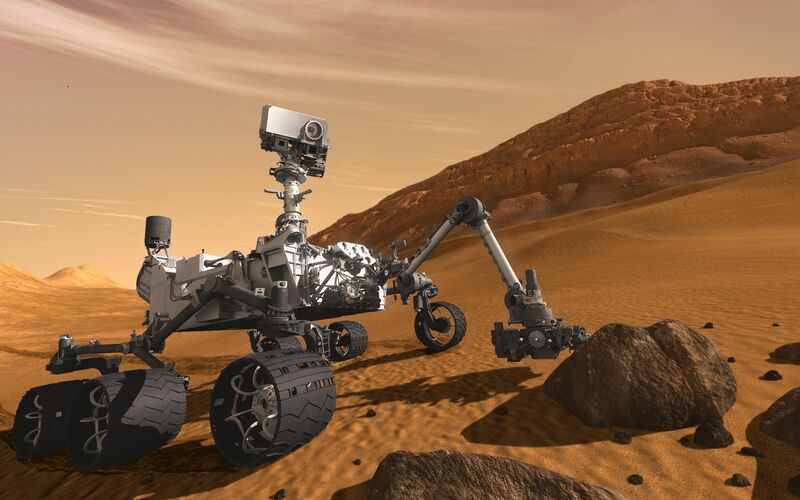 The speaker at our banquet is “The Past and Present of Water on Mars” by Dr. Tanya Harrison – brings the missions on Mars to life, including the Curiosity Rover, which Tanya was involved with. She also describes what “water on Mars” really means. There were lots of questions…a fascinating talk! The reason I wanted to charge the Tesla last night and not have to drive east for 15 minutes to the Tucson Supercharger is that I want to take the 11AM solar telescope tour at the Kitt Peak National Observatory. It takes an hour and 20 minutes to drive westward from the hotel, so driving east to the Supercharger would be inefficient. I have breakfast downstairs in the hotel, and I’m on the road by 9AM. The Tesla uses about triple the energy to climb the 1,200 metre (3,400′) elevation change on the way up the mountain, but there is only about nine miles of actual steep climbing. 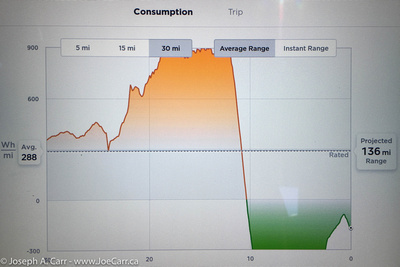 The Model S still has120 miles of range by the time I reach the top of the peak. Since I am so early, I am the only visitor for the telescope tour when I meet the Docent in the Visitor Center. She convinces me that the 2.1 meter observatory tour would be a better choice, since the solar observatory is closed, so all we can do is walk around it on the outside. A Docent-In-Training and a few more people show up before the tour leaves – we stick with the plan to visit the 2.1 meter telescope. I take a few photos, but restrict myself to areas of Kitt Peak that I didn’t photograph last year. By 1PM I’m ready to return to Tucson, so I rig up my GoPro Hero 5 Black as a dash cam and drive down the mountain and along the highways back to the hotel. The Tesla gains about 25 miles of range due to the regeneration on the way down the mountain road, so I still have just over 100 miles of range after arriving at the hotel. Since the staff have left the Tesla Destination chargers powered up, I plug in for about four hours to top up the charge for tomorrow’s adventures. Driving to Kitt Peak in a Tesla from JoeTourist on Vimeo. 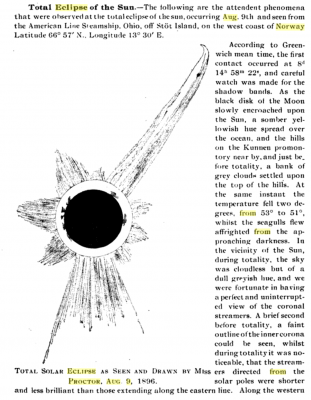 Dragoon Mountain Ranch – more astronomy! February 17, 2018 Friday – Dragoon Mountain Ranch – astronomy! There is fog on the ranch in the early morning and clouds but no rain today. One of our group leaves us this morning to pick up her rental car in Tucson, and drive to Sedona to visit with her family. I plan to drive to Sedona tomorrow to stay two nights, so we might connect up there for a visit. I also plan to drive further north to see the Grand Canyon, but we’ll see how the weather cooperates for that adventure, because if there is too much snow, I won’t go! 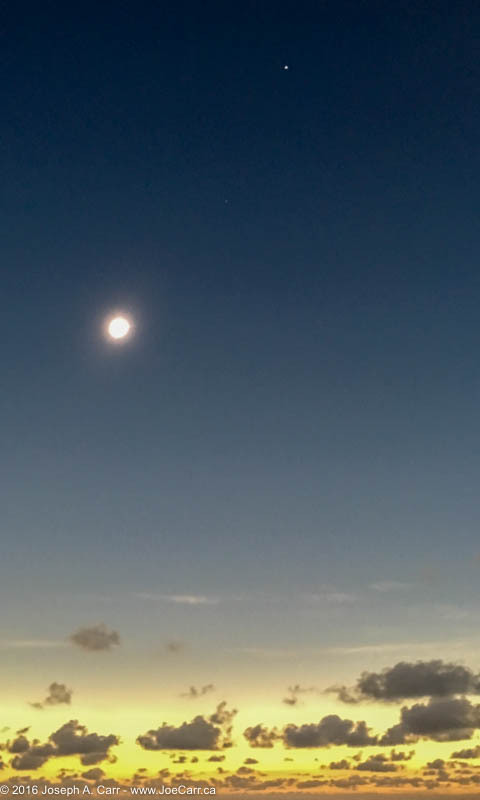 By sunset, there are only clouds on the horizon – it is clear overhead! Everyone gets their gear together, we open up the observatory, and pull an all-nighter. One of our group is a dedicate visual observer, so she operates the 25” Newtonian, climbing a ladder every few minutes to observe visually, and sketching many celestial objects. I join her to enjoy the wonderful views through this massive telescope, and add many entries to my astronomy log book. The three of us who are photographers are using the 20” Newtonian astrograph this evening. Since my images taken a few days ago on Feb 11th turned out so well, I have some time to take more photos, but after taking two good images, we soon run into problems. 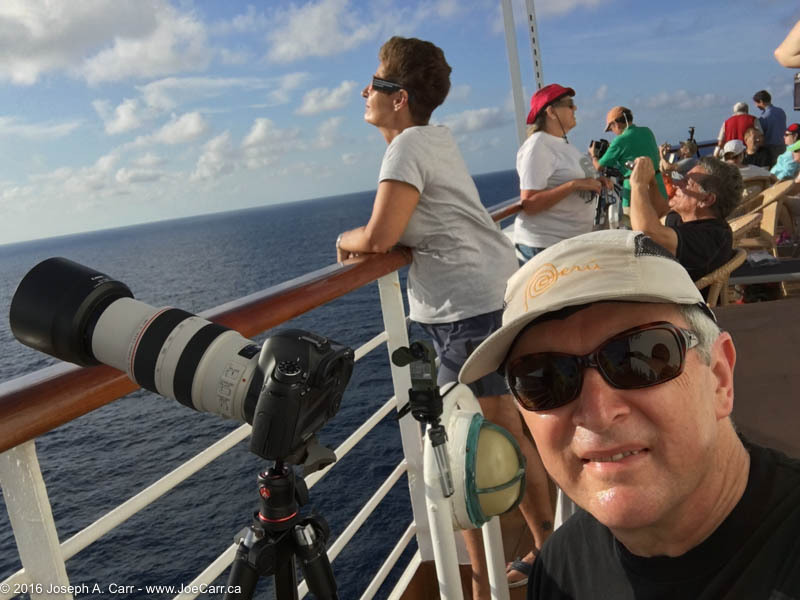 I decide to enjoy some visual observing instead., so my buddies use the rest of the night to take some images of objects they are interested in while I observe using a 25″ Newtonian, my binoculars, and unaided-eye visual observing. I only last about an hour in the cold before I have to pack it in and go inside where it is warm. I am the first up this morning since everyone else stayed up into the early morning hours observing and photographing the night sky. It isn’t raining today, but there are big clouds drifting overhead constantly. I decide to shoot a time lapse video of the clouds forming and passing over the Dragoon Mountains. I rig up my Canon 6D dSLR on a tripod with an intervalometer and shoot medium-sized JPG files all afternoon until sunset when the battery dies. After dinner, I make it into a one and a half minute video and show it to my friends on the living room TV. I also show them the video I shot of the wildfire on the day we arrived. Dragoon Mountains Afternoon from JoeTourist on Vimeo. The rain returns this evening with a vengeance – we can hear downpours happening outside all evening. I check the forecast for Sedona, and it looks abysmal, with torrential rain, hail and winds! I go online to cancel my arrangements up there, and also for Grand Canyon. My Plan B is to stay in Tucson for the next few days, so I reserve a hotel at the last minute. Thank goodness for online booking systems! The rest of us are all leaving tomorrow morning, so we all use the down time do some laundry, pack, and cleanup the house. My Tesla Model S rental car (Turo.com) is delivered to me mid-morning in the hotel parking lot. Both the owner of the car and I inspect it for damage, using the Turo app to document and photograph for the handover process. After the formalities are completed, I am handed the fob and the car is mine for the next two weeks. I then drive my friends to the downtown car rental location so they can pick up their rental car. 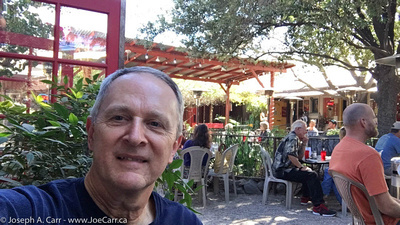 We then go to the old part of Tucson to walk around the El Presidio area and have some lunch at La Cocina Restaurant & Cantina. We take a few photos in the area and we then split up. I find the Tesla Supercharger east of Tucson, since the car needs to be charged up. We buy a few things in the adjacent convenience store, and then leave for the Tucson Airport to pick up another friend arriving on a later flight. We drive about 45 minutes from Tucson east on the I-10 freeway to Benson, where we pick up a few groceries and other supplies from Safeway. Our friend at the Dragoon Mountain Ranch calls to advise us that there is a wildfire near his place however the danger level is low since the prevailing wind is blowing the fire further away. There are road blocks into the area, but he has asked the officers to let us through. Needless to say we are all concerned since the flames and smoke from the wildfires are clearly visible in the area we are heading to! The officers let us through the roadblocks and we arrive at our friend’s place before dark, which I’m thankful for. Dragoon Wildfire from JoeTourist on Vimeo. I park the Tesla Model S in my friend’s garage, so we can plug it into a 115 volt 15 amp outlet. The car starts charging slowly at 12 amps, which means about a 20 hour charge time to 90% state-of-charge. This isn’t an issue, since I don’t expect to be driving anywhere close to the maximum range of the car – about 210 miles at 90% SoC. We have some pizza and salad for dinner, and get settled in after our travels. After dinner, we all go out to see the wildfire in the distance, and then go to the observatory for a quick look through the 25” telescope. There is a beautiful sunset with an arched cloud formation in the west, but ultimately there are too many clouds for observing tonight, so we call it an early night and go to bed. Garry reserved (a few days ago) the Big Room Tour for the Kartchner Caverns for this afternoon. We depart around 1PM so we have time to look around the visitor centre before the tour starts. Unfortunately, photography is not allowed, and they even insist that we leave our cellphones behind in a locker. The tour starts by everyone being taken up the hill in a tram, and then we enter the caverns through a series of doors and air locks. The Big Room is indeed very big, and the history of the caves is interesting, with lots of stalagmites, stalactites, and other cave objects to see. We also learn about the bats who inhabit the cave and use it as a nursery. On the way back, we go to the Benson Golf Course for dinner. It is a modest place, but the food is good and inexpensive. This is our last meal together, since the group leaves tomorrow for home or further travels. Both Reg and I drive the group into Tucson to visit the University of Arizona’s Mirror Lab. John and Garry have visited the lab before, but come along again since it is fascinating. For Reg, Diane, Matt and I, this is our first visit. This lab produces many of the world’s largest astronomical mirrors. The Mirror Lab’s current multi-year project is to make the seven 8.4 metre mirrors for the Giant Magellan Telescope (GMT), which will be located at Las Campanas Observatory in Chile. Combined together, the seven mirrors will form a single parabolic surface some 24.5 metres (80’) across! GMT is scheduled to be operational in 2022 with four mirrors, and will be fully operational in 2024 with all seven mirrors. The first mirror is completed, and the second through fourth mirrors are currently in the process of being made. We leave this morning around 10AM for the Kitt Peak National Observatory. We are driving from Garry’s place to the observatories – a 2-hour trip each way through Tucson. 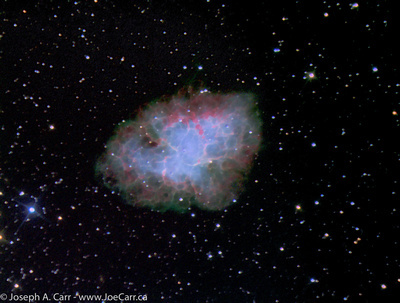 We take the 4 metre Mayall optical telescope tour at 1:30PM, which takes a couple of hours, and involves climbing the hill to the high point-of-land. 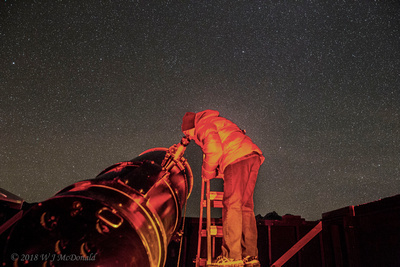 It is exciting to hear from our guide that this venerable optical telescope has found new life and a new funding source, which will allow it to contribute to finding answers about dark energy in the Universe. The facility closes at 4PM, so we don’t have time to explore further, so we head back down the mountain road. It takes about 30-45 minutes to drive SW to Kitt Peak from Tucson on the West Tucson Ajo Highway, and then up the access road. It takes us over two hours each way from where we are staying east of Benson. We passed the Border Patrol security check point on the way to Kitt Peak, and on the way back everyone is stopped for a dog inspection of the vehicle, and a personal ID check. When traveling in this region so close to the Mexican border, be prepared for security check points by carrying your ID with you. Non-US citizens should carry their passports. We stop in Benson on the way back to stock up on a few food and drink items. John and Garry did not join us today, so they are ready with dinner upon our arrival. Everyone enjoys our meal and we are eager to get outside to do more observing. Unfortunately, the weather isn’t ideal this evening with cloud cover dampening our enthusiasm, so we have to entertain ourselves playing a new board game for many of us: Mexican Trains (a domino game). Today is a “down day”, meaning we have no daytime activities planned, so the group can relax and do what they want. I catch up with my social media and email, and work on my journal entries. My blog is still behind – the last entry was for Victoria-Seattle – the first days of my travels, but at least I now have the material to write those blog posts.